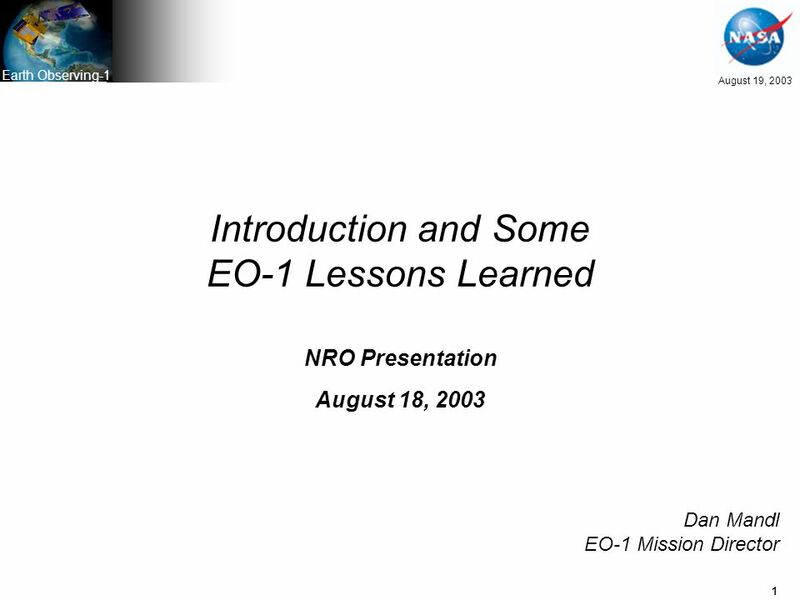 1 August 19, 2003 Earth Observing-1 Introduction and Some EO-1 Lessons Learned NRO Presentation August 18, 2003 Dan Mandl EO-1 Mission Director. 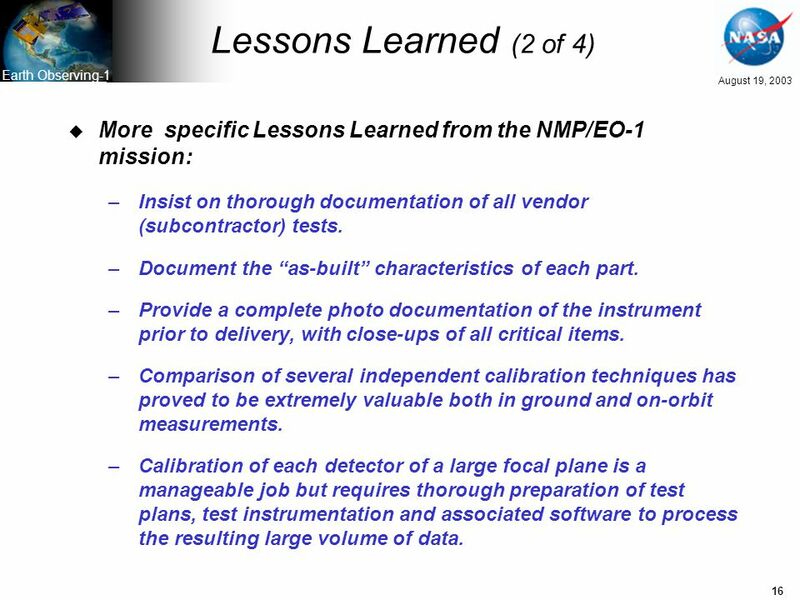 16 16 August 19, 2003 Earth Observing-1 Lessons Learned (2 of 4) u More specific Lessons Learned from the NMP/EO-1 mission: –Insist on thorough documentation of all vendor (subcontractor) tests. –Document the “as-built” characteristics of each part. –Provide a complete photo documentation of the instrument prior to delivery, with close-ups of all critical items. 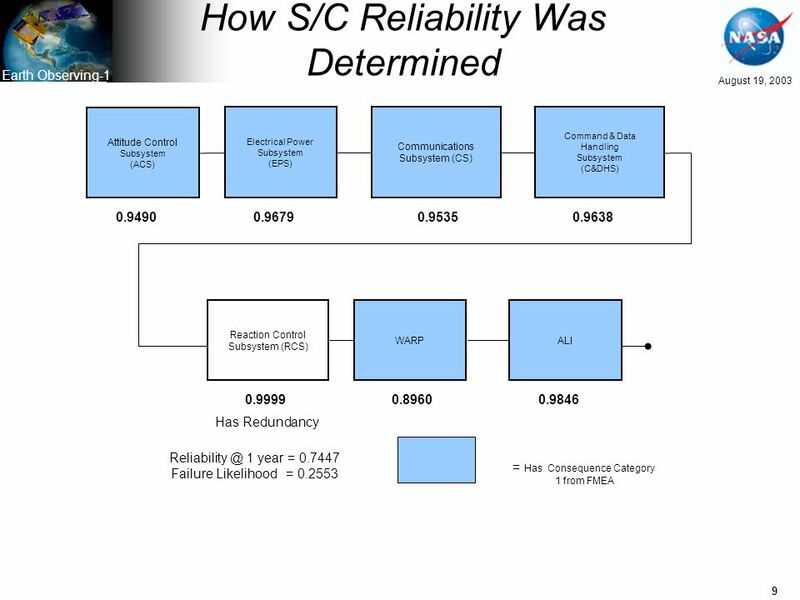 –Comparison of several independent calibration techniques has proved to be extremely valuable both in ground and on-orbit measurements. 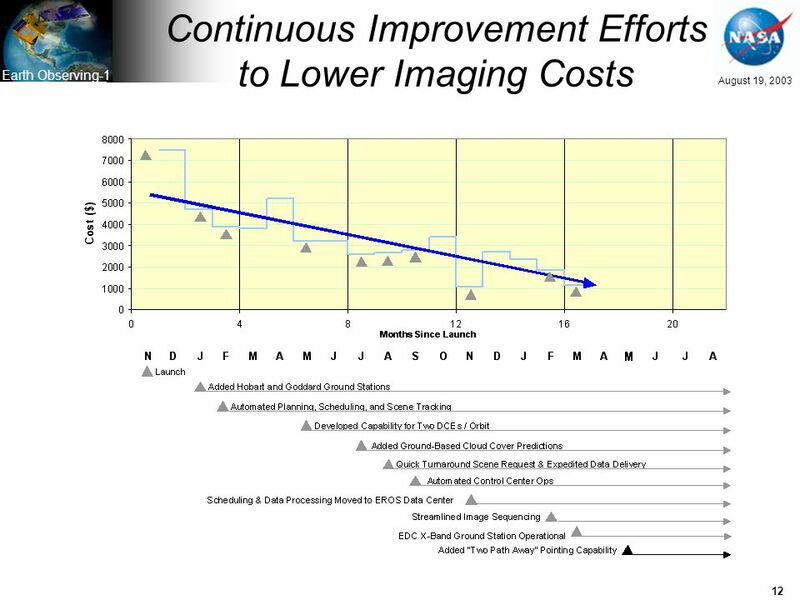 –Calibration of each detector of a large focal plane is a manageable job but requires thorough preparation of test plans, test instrumentation and associated software to process the resulting large volume of data. 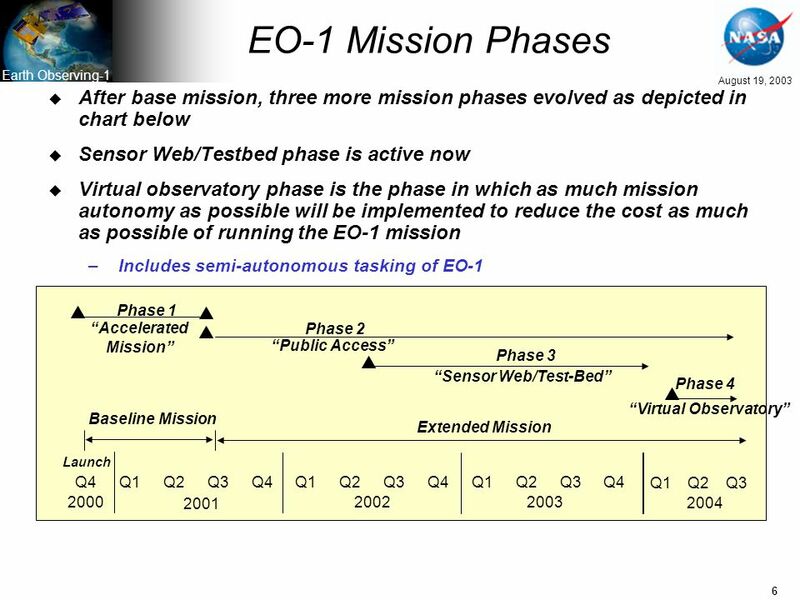 Download ppt "1 August 19, 2003 Earth Observing-1 Introduction and Some EO-1 Lessons Learned NRO Presentation August 18, 2003 Dan Mandl EO-1 Mission Director." 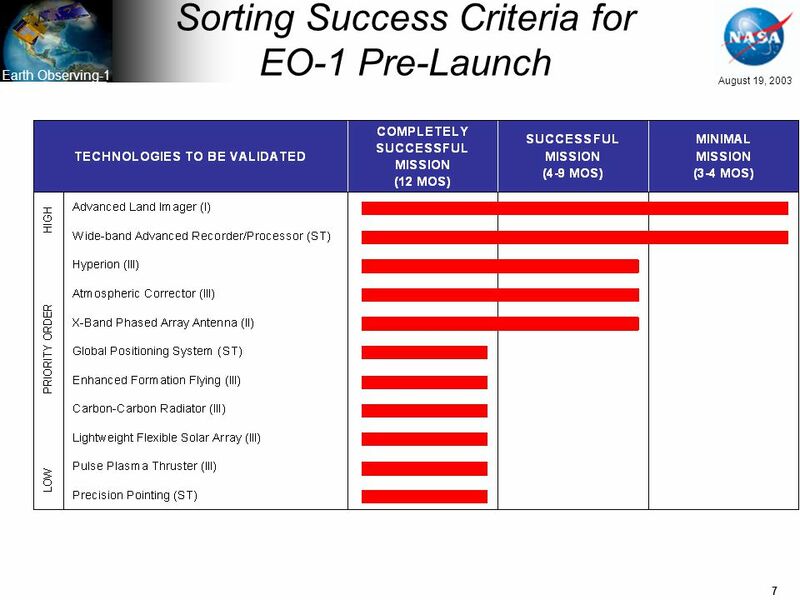 Technology Module: Technology Readiness Levels (TRLs) Space Systems Engineering, version 1.0 SOURCE INFORMATION: The material contained in this lecture. 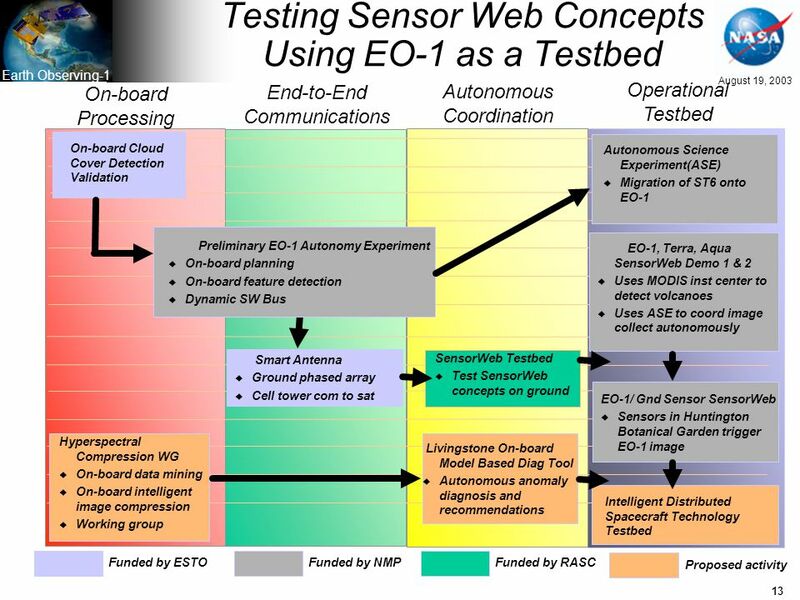 Adaptive Ground Antenna Arrays for Low Earth Orbiting Satellites. Copyright © 2013 United Launch Alliance, LLC. Unpublished Work. All Rights Reserved. 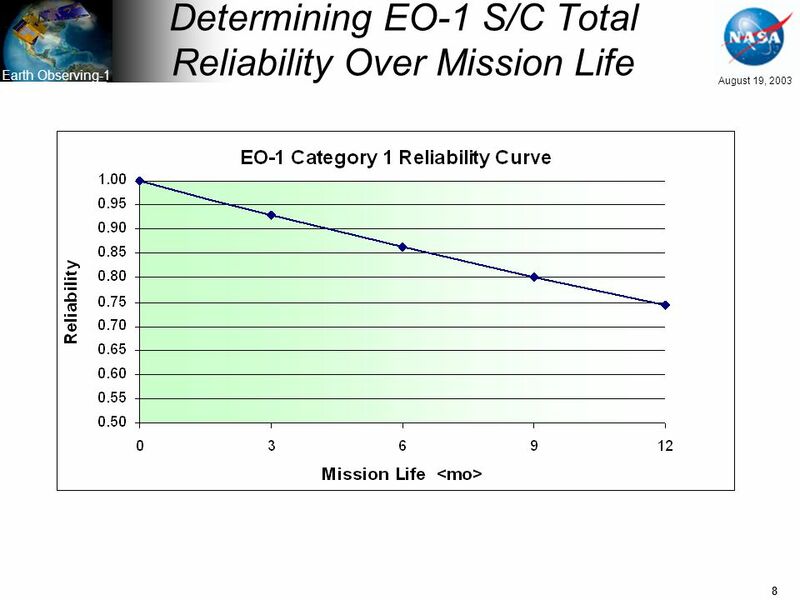 Civil Space 2013 Critical Challenges: Safety, Mission Assurance, and. 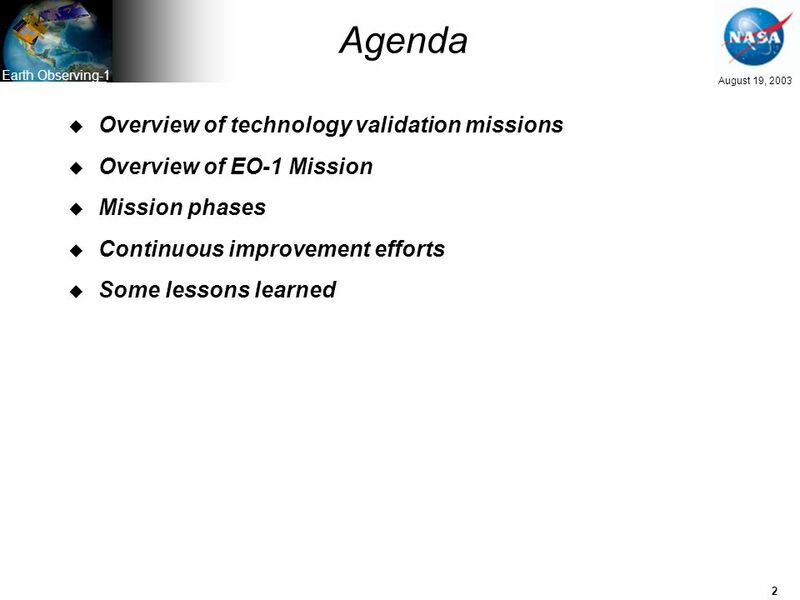 Polar Highly Elliptical / Molniya Orbit Science (PHEMOS) Mission Phase 0/A Studies Mid-Term Review Meetings January 12-14th, 2011. 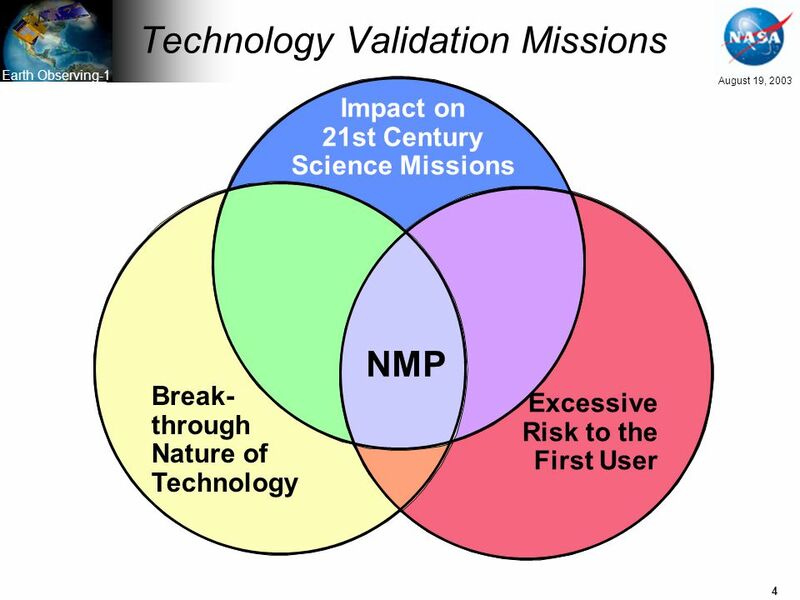 1 Independent Verification and Validation Current Status, Challenges, and Research Opportunities Dan McCaugherty IV&V Program Manager Titan Systems Corporation. 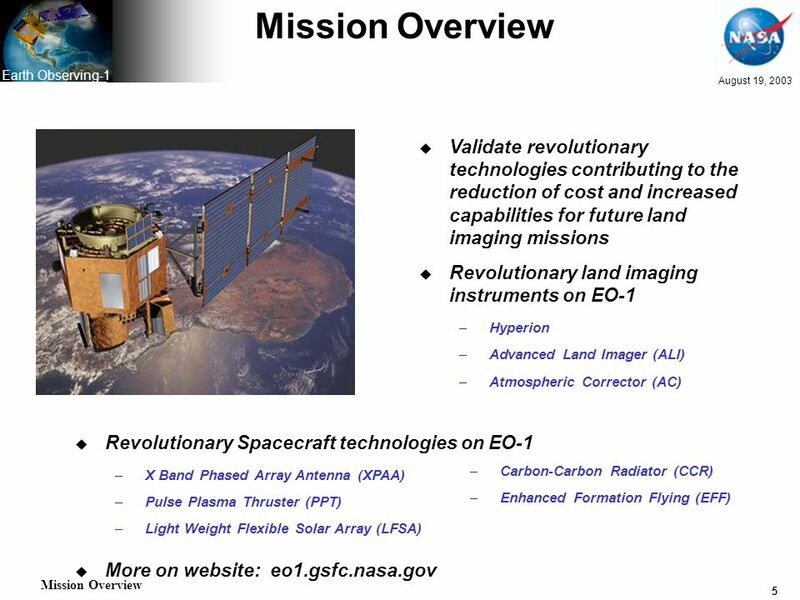 Michael Lampton Overview of Space Sciences Laboratory 16 July 2003. PROJECT ICARUS by Noah Michael, Student Project Manager & Dr. Nikos Mourtos, Faculty Project Manager AE 170A/B Course Instructor. 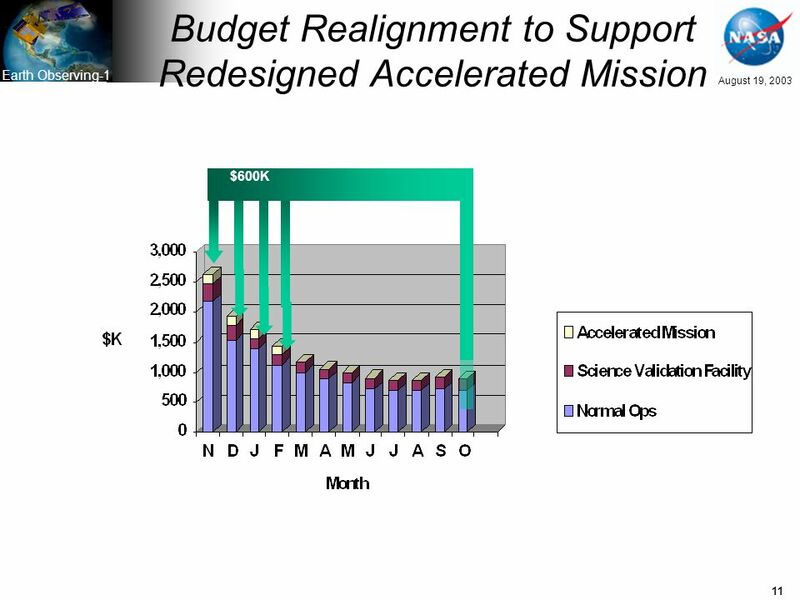 Mission Operations in Small Satellite Projects Making Mission Operations Effective J. Burkert Colorado Space Grant Consortium. 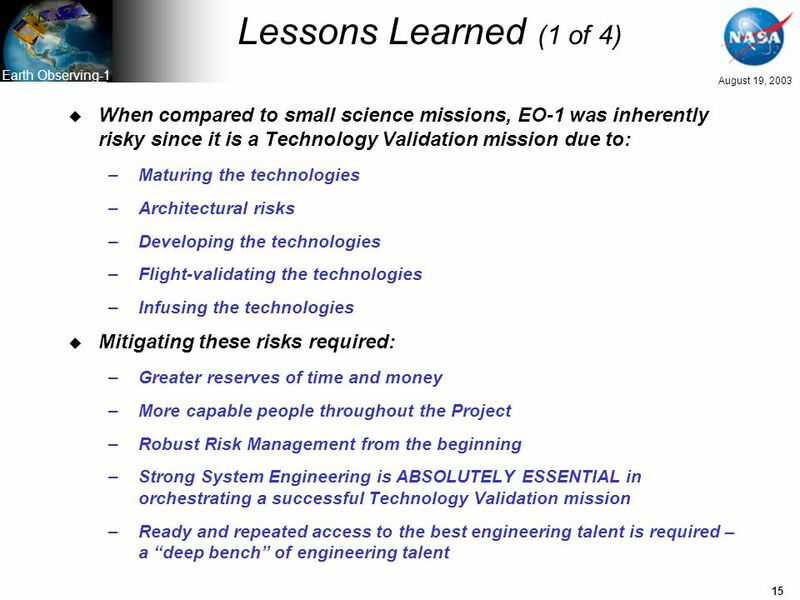 Types of Risks 1.Project risks –Impact schedule and cost –Includes budgetary, schedule, personnel, resource, customer, requirement problems 2.Technical. 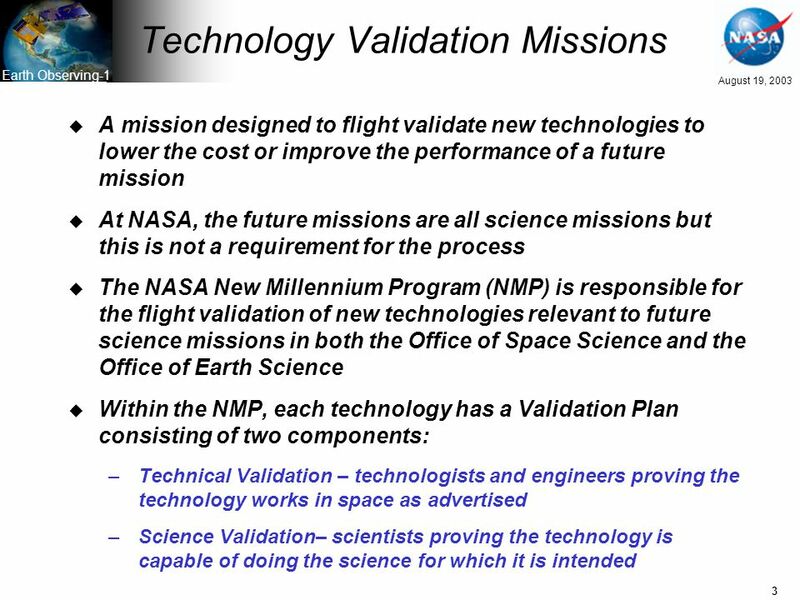 Technical Performance Measures Module Space Systems Engineering, version 1.0 SOURCE INFORMATION: The material contained in this lecture was developed. 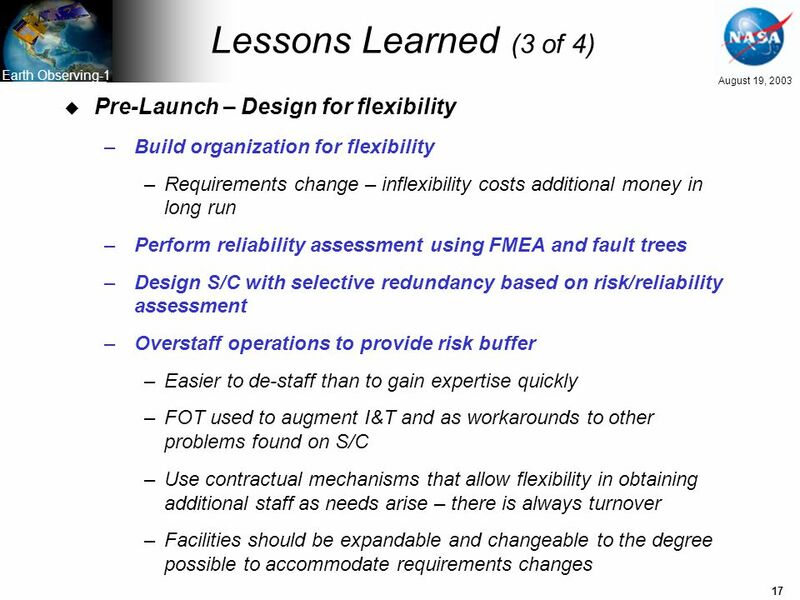 Automation for System Safety Analysis: Executive Briefing Jane T. Malin, Principal Investigator Project: Automated Tool and Method for System Safety Analysis. Mary E. Kicza Assistant Administrator for NOAA Satellite and Information Services Responsible for Responsible for providing timely access to global environmental. 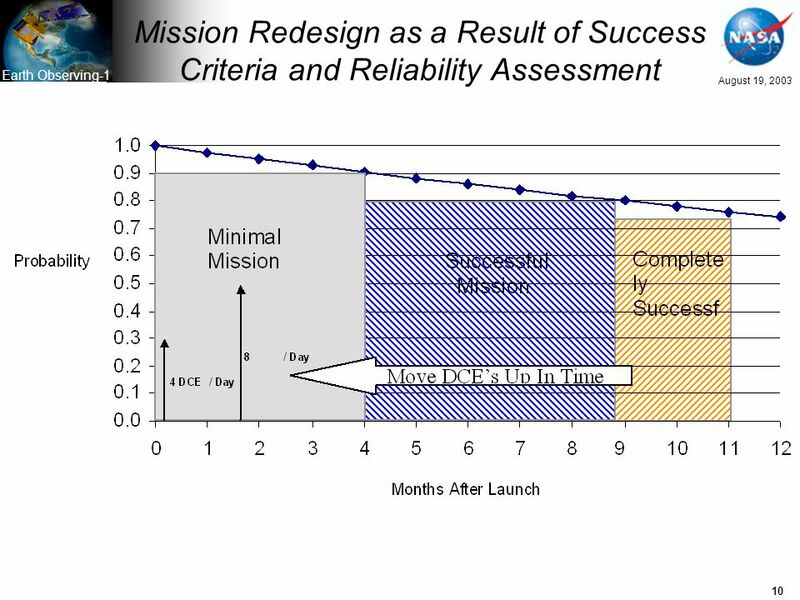 The Pursuit for Efficient S/C Design The Stanford Small Sat Challenge: –Learn system engineering processes –Design, build, test, and fly a CubeSat project. 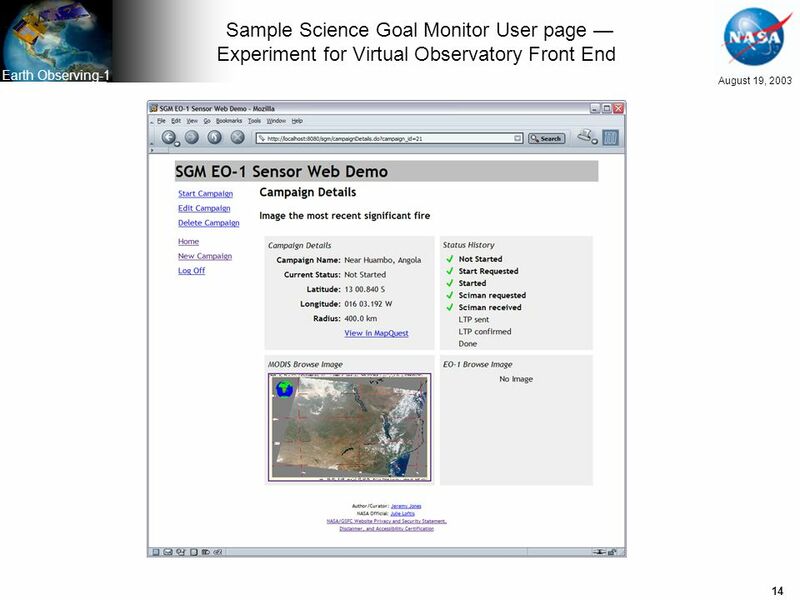 CAPACITY Operational Atmospheric Chemistry Monitoring Missions CAPACITY Final Meeting - WP 3400 - Ground Segment synthesis Final Meeting ESTEC02/06/05.